TMK | Mario in Japan | New Super Mario Bros. 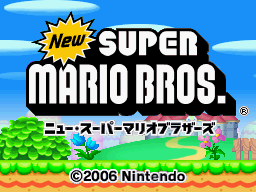 Both versions' title logos are in English, but the Japanese logo includes "New Super Mario Brothers" in katakana at the bottom. Did you spot the other difference? The Japanese version has a registered trademark symbol (®), whereas the U.S. version has a trademark symbol (™). 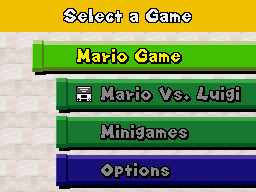 The first option on the game select screen says "Mario" in the Japanese version and "Mario Game" in the U.S. version. 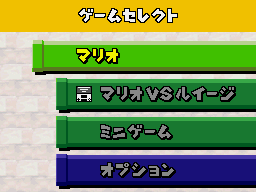 The Japanese version uses several English words, most of which are in all uppercase letters. 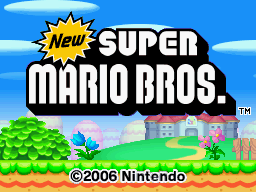 For the U.S. version, the words entirely in uppercase were converted to the more natural-looking title case. Most of the changes can be seen in the following comparisons. On the file select screen, "WORLD" was changed to "World". 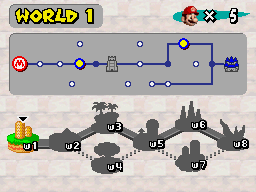 Also, if you compare the W's, you can see that the U.S. version uses a slightly different font here. "WORLD" was changed to "World" on the touch screen map. On the screen shown when entering a course, "WORLD" was changed to "World". 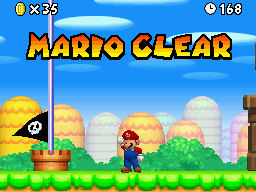 The "MARIO CLEAR" notification was changed to "Mario Clear". The capital letters "M" and "C" are a bit different in each version. 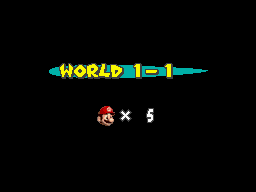 Seen when you don't have a power-up in reserve, "NO ITEM" was changed to "No Item" on the status screen. The "TIME'S UP!" notification was changed to "Time's Up!" in the U.S. version. 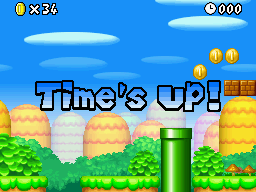 Once again, the capital letter (and punctuation) designs are different in each version. 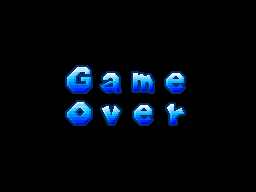 "GAME OVER" was changed to "Game Over". 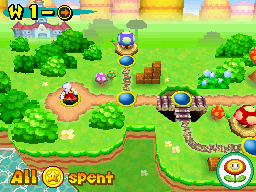 After you find and spend all 240 Star Coins in the game, each version has a different message on the map screen. 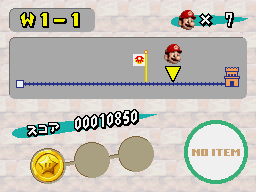 It reads "[Star Coins] all clear" in the Japanese version, while the U.S. version says "All [Star Coins] spent". All names below are sourced from Nintendo's official Japanese and American NSMB guides, as well as the American game manual. Amp: Its Japanese name "Birikyū" is a combination of biri from biribiri (an electric shock) and kyū (sphere). Cheep-Cheep: Pukupuku is derived from bukubuku (a bubbling sound). Flame Chomp: This enemy was first named "Fire Chomp" in Super Mario Bros. 3. Green Koopa and Red Koopa: They are usually called "Green Koopa Troopa" and "Red Koopa Troopa." Koopa Paratroopa: Patapata is a flapping sound. Scuttlebug: Gasagoso is a rustling sound. Squiggler: Wakaba means "new leaves." Sumo Bro: Based on their appearance and behavior, they are actually Sledge Bros. (Sumo Bros. create fire by stomping on platforms, whereas Sledge Bros. throw hammers.) It also appears that there was a Japanese name change for this enemy; they are "Himan Burosu" (Fat Bros.) in SMB3, and "Mega Burosu" (Mega Bros.) here in NSMB. Sushi: "Hōjirō" is derived from hohojirozame (great white shark). Swoop: Basabasa is a rustling sound, similar to Scuttlebug's Japanese name's meaning. 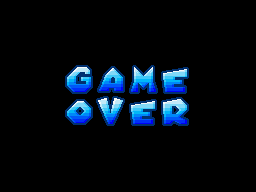 Whomp: Battan means "with a thud." Flying ? Block and Winged ? Block: "Pata" comes from patapata (a flapping sound). Note: Besides "Danger, Bob-omb! Danger! 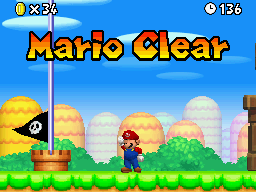 ", "Whack-a-Monty", and "Balloon Racing", all minigames were reused from Super Mario 64 DS. あやうし！ボムへい Ayaushi! Bomuhei Danger! Bomb Soldier Danger, Bob-omb! Danger! ハナチャンをさがせ Hanachan o Sagase Flower-chan Search Which Wiggler? 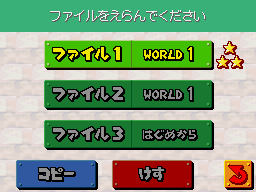 The Mushroom Kingdom \ Mario in Japan \ New Super Mario Bros.